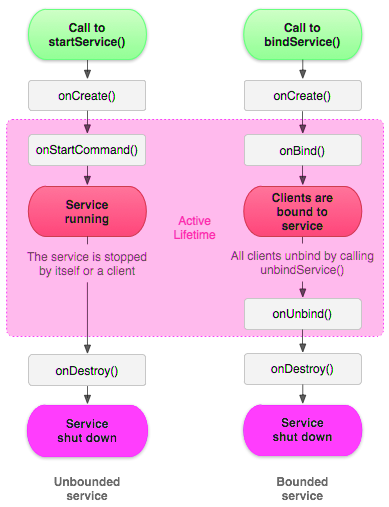 In this tutorial we will explain how to implement Android service lifecycle. Service: is an long-runing application component in background and dose not provide user-interface. the service other application component service can be start automatically after OnStart service used this method onStartCommand(). Request that the service be started, by call starService().via this method,executed the service started in application background. this method when another component to bind with the service by calling bindService(). provide an interface that client used to communicate with the service by an bBinder . this method when the service is first created to proceed one time. before it call onStartCommend() or onBind() and this method already run in background. This method when the service is no longer used and is being destroyed then your service is clean any resource.